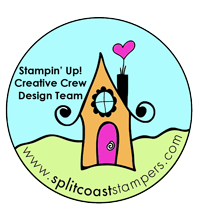 Convention Make ‘n Take | Stampers With Altitude!!! When it comes to public stamping, I just can’t seem to do it. I am not good at sharing supplies! *grins* So, when I go to Convention, I tend not to do the make ‘n takes. It’s just me and my weirdness. So, the card below is NOT my design. This was one of the Convention make ‘n takes. Now, on the day that I stamped this card, I was having a marathon stamping day! I stamped 4 cards in about 4 hours. That’s unheard of for me. Three of the cards that I stamped were of my own design (that’s the incredible part). I was on a roll! At first, I wasn’t sure if I liked this card or not. I like it MUCH better in person than I do in a photo. Anyway, I thought it was super cute and thought I would share.